Sailor, midshipman, gold miner, explorer, journalist and politician. Hodgkinson was born at Warwick, England. Hodgkinson first came to Australia in 1851 (aged 16) while he was working as a mid-shipsman. He returned to Australia in 1853 and worked as a clerk to Maryborough Goldfields Commissioner, William Templeton (1828-1890) See http://adbonline.anu.edu.au/biogs/A060270b.htm. Hodgkinson returned to England in 1854 and worked in the War Office. He returned to Melbourne in 1859 and worked as a journalist at the Melbourne Age. Hodgkinson met Burke while he was stationed in Castlemaine. At Bendigo on 30 August 1860 Burke sent a telegram to the Exploration Committee requesting that Hodgkinson be invited to join the expedition. Hodgkinson departed Melbourne and joined the party on 10 September 1860 at Swan Hill. Burke chose not to take Hodgkinson on with the advance party to Cooper Creek, and so he stayed at Menindee with the Supply Party. Hodgkinson then travelled with Wright from Menindee to Bulloo, and returned to Menindee on 20 June 1861. After returning to Menindee, Hodgkinson then travelled to Adelaide with Wright, arriving on the 6 July 1861 (SAA, 8 July 1861, p.3). He met Captain Cadell who had intelligence of two missing camels which had been seen in the north of the colony near Mount Victor. Hodgkinson was sent to retrieve the camels. Argus, 15 July 1861, p.5. Mr Cadell to Dr Macadam. Two camels, one in bad condition, have strayed on to Dr Brown's run in the north, near Mount Victor. Wright and I have thought fit to detain Hodgkinson, who will start tomorrow morning, for the purpose of identifying the camels, as to whether they are those lost by Wills, or belonging to Burke’s advanced party. The Chief Secretary kindly arms Hodgkinson with circulars to all Government officers to render him every assistance. I can recall, or communicate instructions to Hodgkinson tomorrow by telegraph, if he did not leave in the morning. He would be detained a week. Wright left per Aldinga today. Mount Victor is nearly 200 miles from the Burra, and can be reached in seven days. South Australian Advertiser, Saturday 20 July 1861, page 3. Mr A Blyth asked whether the Secretary to the Exploration Committee had been informed by the Government that information had been received respecting two camels before this? The Commissioner of Crown Lands said that he had not forwarded the first information received about the camels, because one of the gentlemen connected with the expedition, he believed Mr Hodgkinson was the name, had started off with the view of recovering them, and he had himself telegraphed to the Exploration Committee upon the subject. Mr Duffield said that he had been in communication with Captain Cadell, and that gentleman had, he believed, been in communication with Mr Hodgkinson. From what he understood he thought if the police were instructed to keep a good lookout in the neighborhood of Wellington, they might shortly find the camels in that locality (Hear, hear). Mr Grundy asked whether a day or two ago orders had not been issued by the Commissioner of Police to all the out stations, instructing them to keep a sharp look out for all camels which might be astray? The Treasurer believed that such an order had been issued as mentioned by the Hon Member. Hodgkinson wrote to Macadam from Mount Victor on 22 July 1861. By 27 July, Hodgkinson was at Kooring (Burra) in South Australia (SAR, Wednesday 31 July 1861, p. 2), and on Sunday, 4 August 1861, he returned to Adelaide with the two missing camels. South Australian Advertiser, Thursday 8 August 1861, page 3. The two camels which were brought down from Truro on Sunday last are still at the Police Barracks, North-terrace, and continue to attract a large amount of interest. As stated by us in a previous notice they have been suffering slightly from scab, and on Wednesday morning they were subjected to treatment for that disease under Mr Hodgkinson. During the time their skins were being washed, they exhibited considerable uneasiness, and lashed out right and left on the application of the lotion used to the diseased parts. Mr Hodgkinson informed us that with proper treatment he anticipates that the animals will bo restored to perfect health in a few weeks. Hodgkinson offered to return to Cooper Creek with McKinlay and on 6 August he had been appointed second-in-command of the South Australian Burke Relief Expedition. South Australian Advertiser, Wednesday 7 August 1861, page 3. Party in search of Mr Burke: On Tuesday, Mr John McKinlay, the leader of the party about to start in search of Mr Burke, was engaged with the Commissioner of Crown Lands and Inspector Hamilton for some hours at the John Bull Yards, Currie-street, in selecting the horses and men for the Expedition. There were a very large number of people present, and a great many horses were offered, so that a tolerable choice was afforded, and we think those which, have been selected are very likely animals. We believe the average price to be about £26. The names of the men engaged are Bell, Poole, Kirby, and Middleton, besides Mr Hodgkinson, who goes as draftsman, and whose former experience in Burke's party, especially with the camels, will be valuable. We believe another person is in view to make up the entire strength of the party, which is intended to start within a, week from the present time. Hodgkinson resigned this position on the Diamantina and finished the South Australian expedition as a horseman. 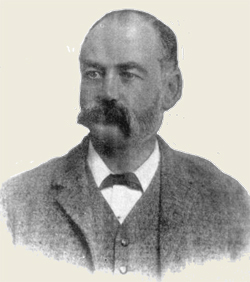 Hodgkinson later moved to the Etheridge and Palmer goldfields. James Venture Mulligan named the Hodgkinson goldfield after him. In 1888 he was elected as Member for Burke in the Queensland Parliament before moving to Western Australia in 1893. He died of influenza in 1900 in Petrie Terrace, Brisbane.